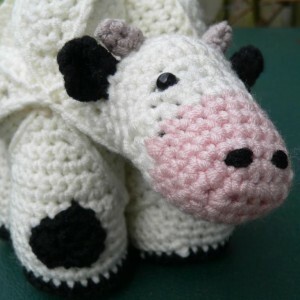 I would like to introduce you to Chloe the Crochet Cow Puzzle. She is just one of my many Amamani Patterns ( short for Amigurumi Amish Puzzle Animals). 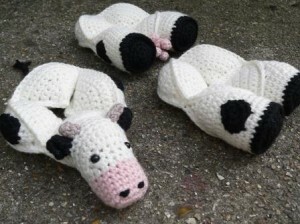 The Crochet Cow Puzzle is based on the original Crochet Amish Puzzle Ball, and as such comes apart into 3 segments, or rings, which then have to be re-assembled to form the cow. The chunky design makes her perfect for little hands to grab hold of and your colour options are limitless! Think cows are just cream and brown and black? Think again! This is just one of the many colourful cows my testers came up with. Amy has tested for me a bunch of times and her photos are always so pretty and inspiring. You can see more of my testers’ colourful creations here. 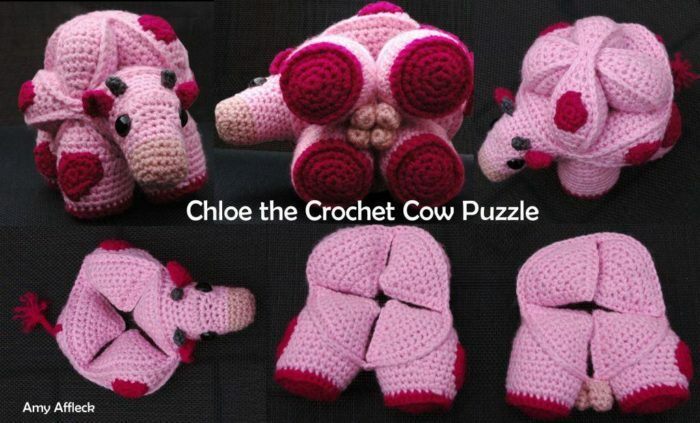 Using the hook and yarn specified, Chloe the Crochet Cow Puzzle works up to 13 cm wide x 15 cm high x 15 cm long. That is roughly 5″ x 6″ x 6″. But you can always use a bigger or smaller hook and thicker or thinner yarn. Gauge doesn’t matter, but if the yarn you use is too thin for the hook you use, you will end up with holes in your lids. And if you do make Chloe with odds and ends of yarn and some of the yarns are thinner than others, please make sure that the yarn you use for the lids is as thick, or thicker, than the yarn you use for the wedges, otherwise the lids will be too small. The wedges are more forgiving than the lids! The pattern for Chloe the Crochet Cow Puzzle is suitable for Advanced Beginners. Although this pattern is easy, it is detailed, so you will need to have a good grasp of the English language. If you are not comfortable with English, you are probably going to struggle with this pattern, so I would advise against purchasing it. The pattern also makes use of short rows to help shape the cow’s head (only a few), but they are clearly illustrated and thoroughly explained! 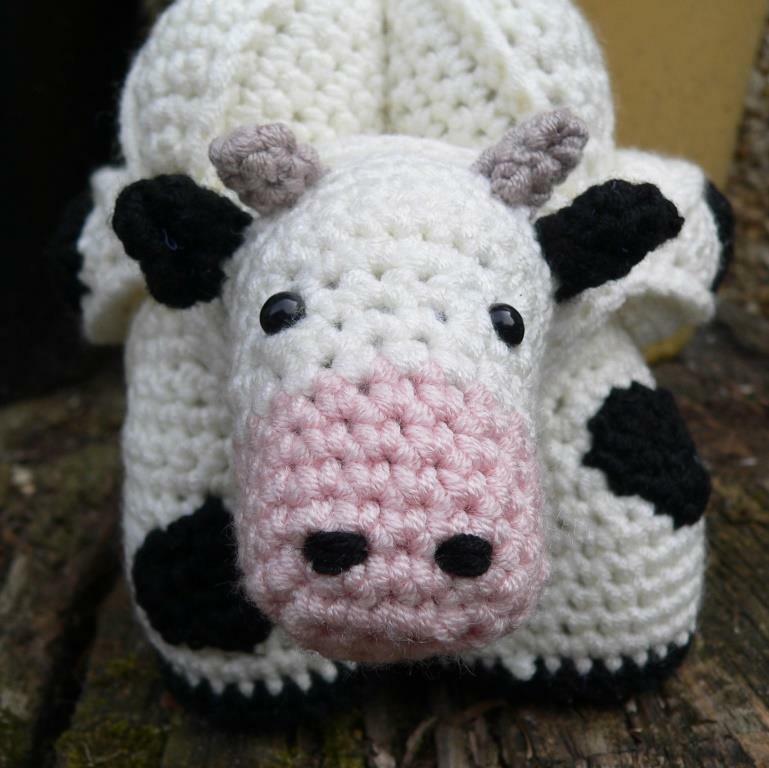 The pattern for Chloe the Crochet Cow Puzzle is now available in my Ravelry Store. 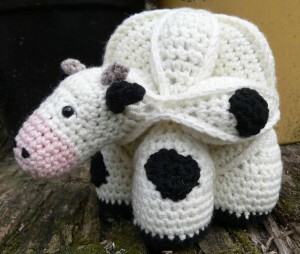 I hope you feel inspired to make your very own Crochet Cow Puzzle and cannot wait to see all the variations! I already have your Amamani book and made the dinosaurs and the elephant. I’m working on the giraffe now and expect to make all the puzzles in the book.. I also made all your free patterns, the Amish puzzle ball, Kiwi, Octopus and crocheted flower puzzle ball. I enjoyed making them and my numerous grandchildren love them. Would you consider to BUNDLE sell the Rhino, Horse, Cow, Fish and any other animal puzzle patterns that you are selling? It would be a real help for someone with a fixed income. Also, if you are developing new patterns and are looking for testers, I would love to be considered for the task. I realize that I live in the US but with computers it may not be a problem. Thank you, Karen :) It makes me so happy to hear good feedback. I love your amamani creations Dedri. I have made 2 of the octopus, although the first one only had six legs! My grandson loves them and he’s eagerly waiting for me to finish a kiwi bird for him. The critters you have designed have inspired me to write a childrens’ series of books based on amamani. I would like to direct people to your site to make their own amamani’s, and hopefully get a whole new generation of children into crochet and knitting. Which web site would you prefer people to use as first point of call? What a cute cow! Moved from Kansas to Nebraska this month and we just got our internet hooked up so I hadn’t been able to check my email but when I finally did what a nice surprise! Cows are really fun and popular and you did such a great job on this puzzle ball. Thank you! Have a great day! Looking forward to this new pattern Dedri! Your creative talents astound me! Cows are always fun and popular! You did a great job! Thank you so much for sharing your gifts and talents with us. Have a blessed day! ps: why not a “Amish Rooster” hehe the emblem of France, with a baguette under the go !!!! hihihi!!!! Peggy, I’m not sure yet if I am going to do a giveaway…maybe…probably…the link for my Ravelry Store is in the post above.